When all is said and done, and we’re standing at the pearly gates waiting to be judged for our works, we all hope that we will have contributed enough good to society to make it through. This guide is our humble attempt to sway that decision in our favor. Where are the best donuts in Utah? We are confident we have found the answer to that question. 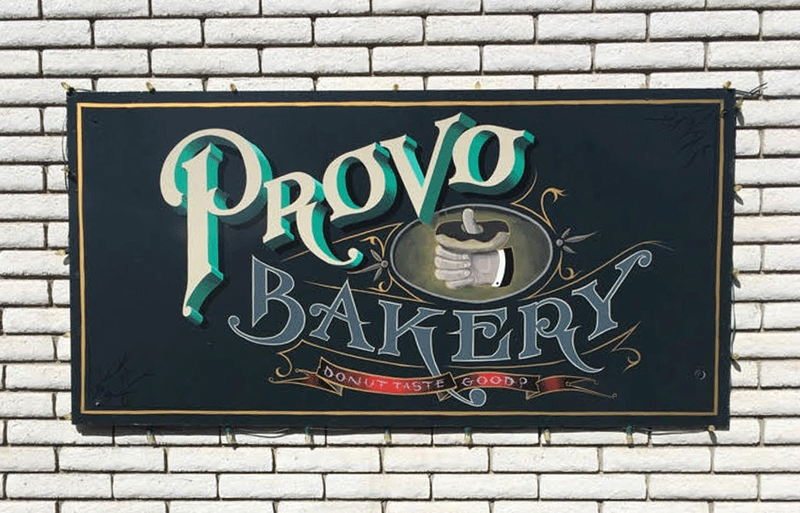 We submit to the world this comprehensive report, which includes our findings from 33 different bakeries and food trucks in Utah. We do not treat this subject lightly. We aim to objectively describe each donut experience, but we aren’t perfect. Casey is the dedicated maple bar aficionado. Braden is the dedicated filled donut aficionado. Neither of us have a preference for cake donuts, which has been a sore spot for our friends (who are wrong) from the east coast. Mentions of cake donuts are limited. If you don’t agree with us, hot takes are welcome. Please @ us. We are by no means foodie/mommy blogger pros. So if you’re looking for perfectly positioned donut photos on chevron plates with frilly napkins, you won’t find any. We’re just a couple of dudes who love donuts. We promise that what we have to say makes up for our lack of designer photos. Our findings are exclusively from local bakeries in Utah (including food trucks). None of our research included national chains like Krispy Kreme or Dunkin Donuts. We also did not include grocery stores. We may or may not include grocery stores in the future. The map below shows every bakery we hit. Our goal was to create an in-depth reference guide of the best donuts in Utah. So don’t feel like you have to read the whole thing in one sitting (unless you love donuts as much as we do). Come back to it again and again to find new places to try or to see how your opinion compares to ours (again, hot takes welcome). For those of you who don’t want the dirty details from every shop, we have provided the infographic of our overall choices of Utah’s best donuts below. You’ll notice there are no numbers. It was difficult to rank many of our favorites ahead of others, so our choices simply list the 3 or 4 best in no particular order. These guys have a few storefronts. We tried out the shop at Station Park. I’m a fan of their unique triangle shape. 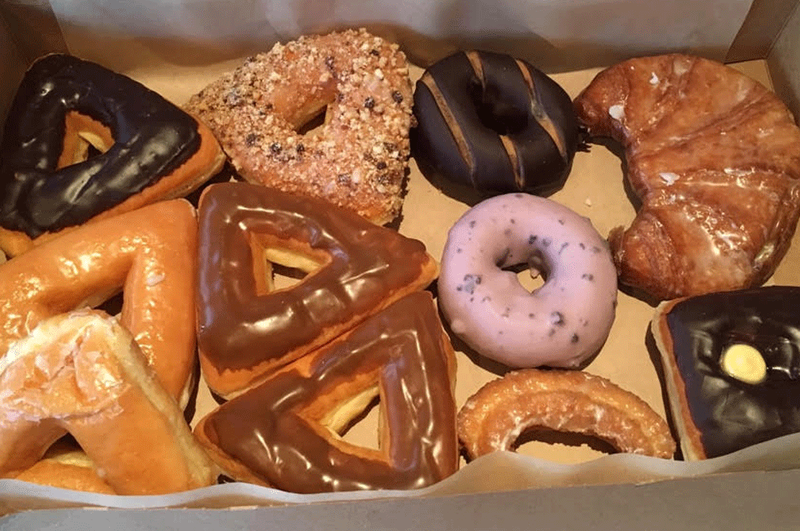 The donuts fit really nicely into a box, and they have a nice corner to bite off. However, in terms of my overall rating, I’d put them right in the middle. Honestly pretty good, but they didn’t pull me into an out-of-body experience. However, the donuts are made in their Clearfield location, so I want to try them again straight from the source. 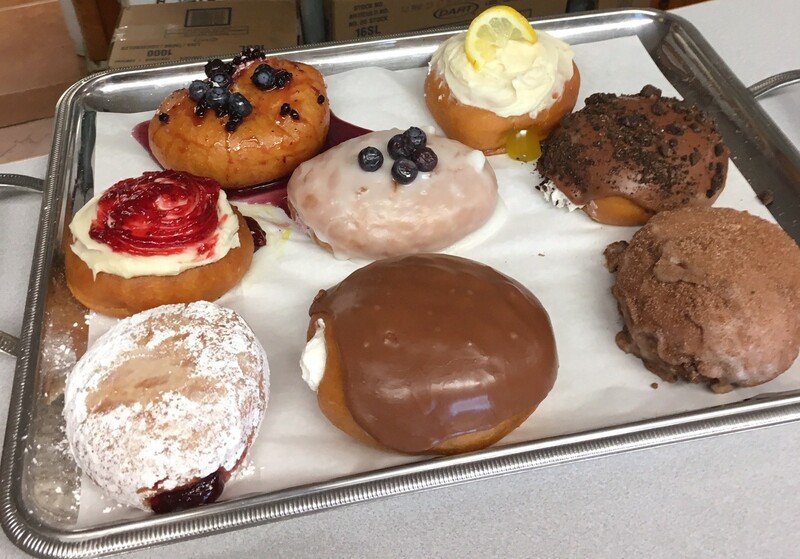 Mountain Donuts takes a unique approach by starting with a fresh baked cake donut and allows you to customize it to your heart’s desire. With hundreds of donut combos you cannot go wrong in your pursuit of perfection. I tried to go fancy at first but ultimately a classic cinnamon drizzled in honey won me over. 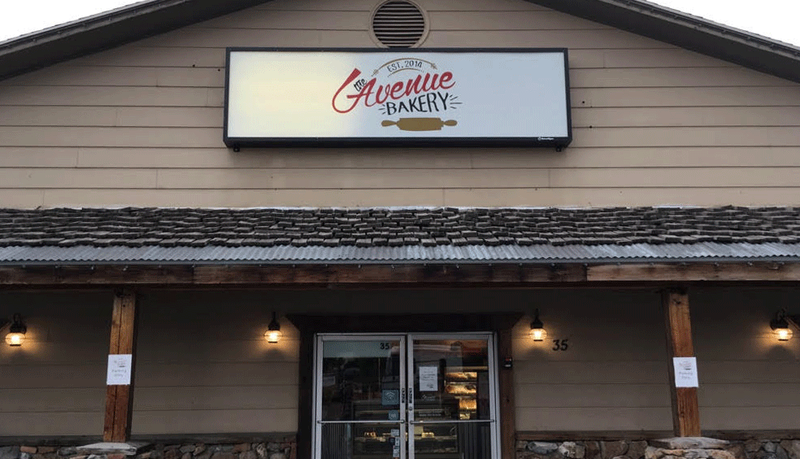 This isn’t your traditional bakery so don’t go in expecting donuts and cinnamon rolls lining the shelves, but if you’re looking to try something fun and quirky this could be a good fit. If the owner, Paul, is in tell him “the two guys in sleeping bags sent you”. God Bless. Not sure we would even call this place a donut shop. They make a few donuts, but mostly other types of baked goods. Don’t expect to get any donuts until after 8:30am, even though they open much earlier. This is a hard one for me. I was enticed to go here because a coworker brought me some donuts from here and they were delicious. When we went in person it was not the same. My donuts were burnt and the frosting was thin and runny. While waiting for my donuts to be made I had a cinnamon roll and it was delicious. When I first pulled up to this shop, just a few blocks removed from the bustling 25th street, I wasn’t sure it was even open. It kinda looks like a bread outlet store. But there’s no denying these guys have something special going on. I went in the early afternoon and the donuts were still soft and delicious. With every bite I took, I became more mystified by their dough: a soft, doughy center with an outer layer of golden, flaky goodness. And not even being a maple bar guy, I really liked theirs. So take that for data. **Braden’s Update** They do not make fresh donuts on Saturday. Do not go on Saturday expecting to get any donuts. Worst Saturday of my life. We got a lot of recommendations for this place, but most people included a caveat: Tasty’s isn’t what it used to be. Based on what everyone told us, we wished we had been around in the good ol’ days when Tasty’s was allegedly producing die hards with it’s fried creations. From what I had, it was better than a grocery store donut, but that is about it. The first bite cracked the frosting throughout the maple bar, and I had to bear watching the sweetness of my donut fall to the floor. On the bright side, the regulars that visit the donut shop in the morning are A+ quality. Average donuts, exceptional people. I’m not sure what to make of this place. 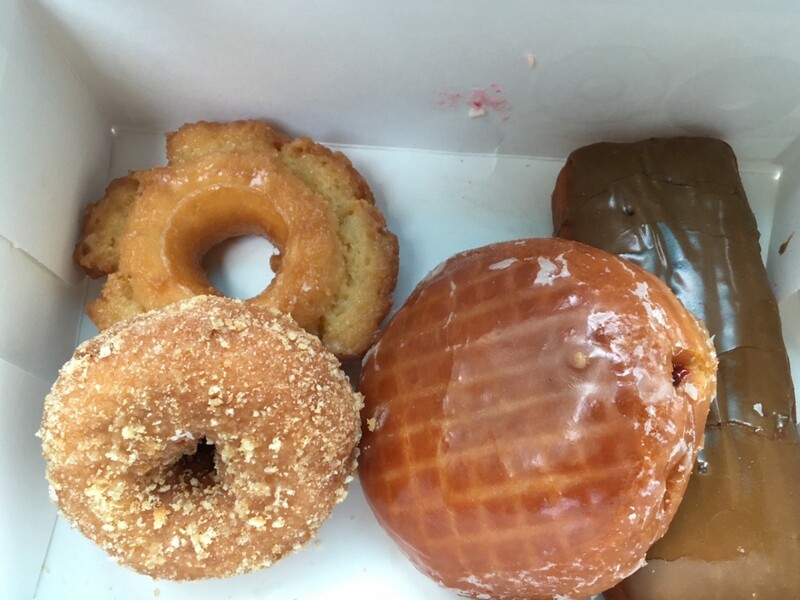 The donuts were decent, nothing to write home about (if I were somewhere away from home, and I wrote home every time I found a donut shop I loved). But this is a blog, and costs me $0 in paper and postage. So here I am writing about it. The glaze and the maple topping on the maple bar were both great. But the dough just didn’t do it for me. They did have some different options that I didn’t try, like a raspberry cream filled maple and some ones with interesting toppings. A donut is only as good as its dough (side note, this is the most compelling argument for doughnut vs. donut to me). Johnny O’s does not use a traditional dough but rather they use potato flour. If you ask them in the store they do not make donuts, they make spudnuts. In a fast paced world when mass production is key Johnny O’s slows things down to make sure they keep their dough soft and fluffy. When you roll up to this establishment, you get a nice warm welcome of small-town feels that only intensifies as you step inside and meet the people behind the counter. Tina and Maggie are donut angels, inside and out. Their specialty is filled donuts, which speaks to me in my native tongue. The raspberry filled was amazing. Arguably the best filling I have come across anywhere. Not too tart, not too sweet. The glaze on the wonderful dough surrounding it was not crunchy/flaky, which I usually prefer, but it was moist and dense and delicious. Stuck to my fingers like a powdered sugar glaze. I also tried their churro donut, which was refreshingly unique and comes filled with whipped cream. I also had the lemon. Lemon filled is probably my least favorite filling in general, but this one was amazing. I’ve been told that you can call ahead and order ANY flavor, even custom flavors. My only beef with this place is that it is so far away from me. That just makes it all the better when I do make it up there! Where do I even begin. A good donut will always come down to the dough. I’ve found it’s common for some bakeries to put fancy toppings on subpar donuts to try and fool you into thinking their donuts are good. None of us are fooled when someone with B.O. tries to cover up the smell with cologne. So why do we let it slide with donuts? 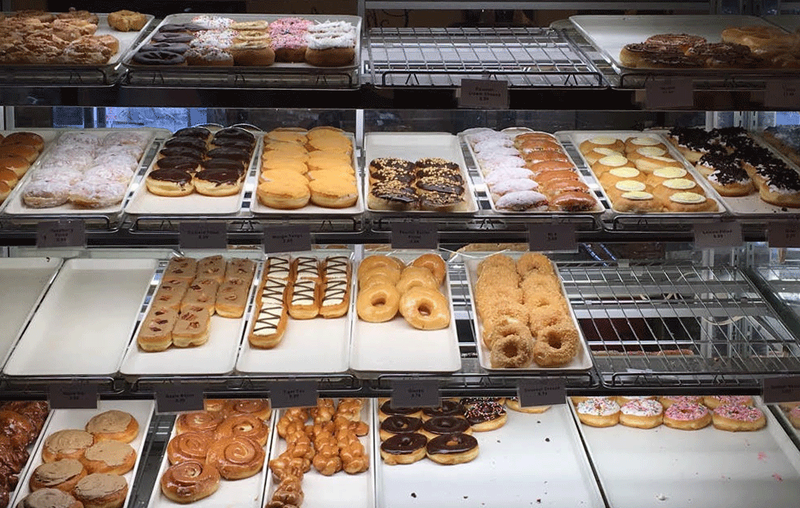 In my humble opinion, the dough at Fresh Donut and Deli is — if not the best — tied for the best donut dough in the state. My absolute favorite here is the blueberry glazed. That donut melts in your freaking mouth. It’s simple perfection. But because the dough is perfect, you literally cannot go wrong here with anything they make. As bad as it sounds, we went into Banbury with a little bias against them. Mostly because everyone seems to profess they’d give their firstborn for a donut there. But we were pleasantly surprised. When your donut shop has a shed to house all the sugar you go through, you know you’ve made it. They are one of the most popular donut shops in the valley, and I understand why. We ate our donuts in the shop and the visitors were non-stop. Their maple bar was the best I’ve had when it comes to using the maple glaze (see Lehi bakery). The dough consistency was perfect, not too thick but not too airy, while maintaining the melt in your mouth experience. We had to rate them pretty high. But we still don’t put them ahead of Donut and Deli if we were forced to do an SLC head-to-head donut battle. This shop is connected to a bridal gallery or something like that. We weren’t really paying attention, because donuts. I had the glazed donut and a few bites of a frosted cake donut. The glazed was actually not that bad. It took me a few bites to begin to appreciate it. The dough is more dense than your average donut, which I didn’t hate. But the donut I got was only glazed on top. Too dry for my liking. Though I did get a cheese danish and that was delicious. So I imagine a lot of their other bakery treats aren’t as bad as their donut selection. With the limited supply of donuts you can tell this is not the bakeries number one priority. But with the small quantity they have they make up for it in quality. A little heavy for my liking and limited supply so I can’t rate them with any of the greats but if you are in the area it is worth your time to stop in and grab a bite. If you really want to make their day wear something pink (trust us you’ll know what we mean once you step inside). I almost feel bad including this on our list. I only wanted to put this review on here as a cautionary tale because Little America does so many breakfast/brunch things well. In fact, their hot chocolate is easily my favorite in Utah. But I have witnessed multiple donut fans swoon with excitement when they found out Little America’s well-kept secret: their donuts. This is one of those examples of a secret being well-kept for a reason. Don’t go here for donuts. They are not delicious. End. Schmidt’s Bakery has been around for nearly half a century and there is a good reason why. They are a true bakery that specializes in donuts, bread loafs, cakes, etc… They have a large variety and are all pretty good. I have a hard stance on no cake donuts but their old fashion was something special. Worth your time if you are in the area and have a sweet tooth. 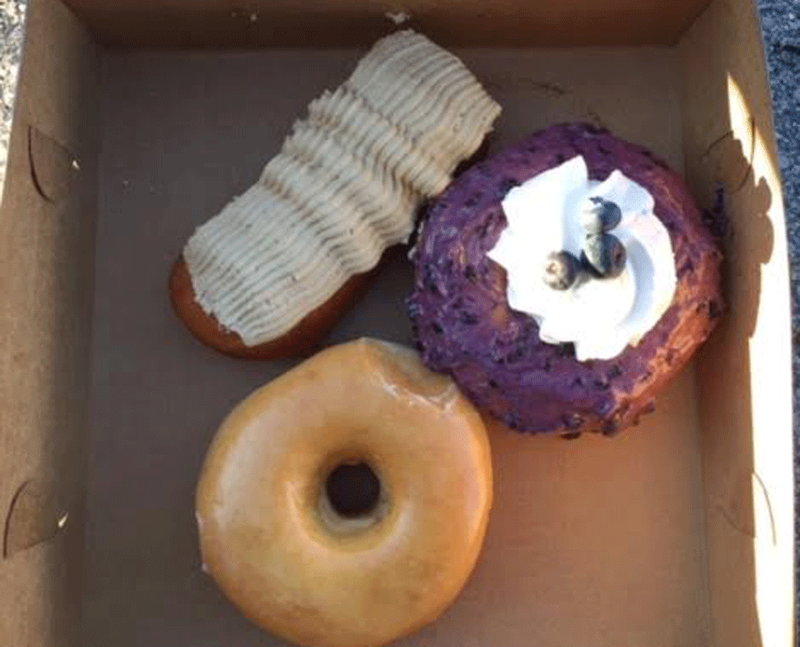 As self-proclaimed non-fans of cake donuts, we weren’t quite sure how we would like Dunford. All the donuts we see in stores and gas stations from Dunford are cake donuts. But their HQ store is a giant, wonderful, self-serve mecca of donuts: cake and raised alike. I had a Reese’s Peanut Butter Cup donut — which was pretty good — but I love Reese’s, so that doesn’t say much about the actual donut. One of the gems I found there was a raspberry cream donut, which was a raspberry filled donut with cream frosting. If you like filled donuts, that is one I recommend putting in your belly. For a shop that probably produces the most donuts (for a local bakery) in Utah, Dunford does a good job maintaining enough quality in their quantity. They use a maple frosting rather than a maple glaze, this is my favorite but not what caught my attention. The blueberry with whipped filling was a beauty. Made with real blueberries each bite brought a new sensation. Lots of variety to find something you’ll like. We grouped these two together because from what we can tell, they are run by the same parent bakery: Sugar Baby’s inc. In terms of a good, overall donut shop, these guys did a pretty good job. They have some of the most unique donuts we have found in any of the shops. For example the root beer float donut. I was super skeptical about this. Anything root beer flavored usually isn’t my favorite. But the donut was pretty good. The root beer glaze and the whipped cream filling worked really well together. 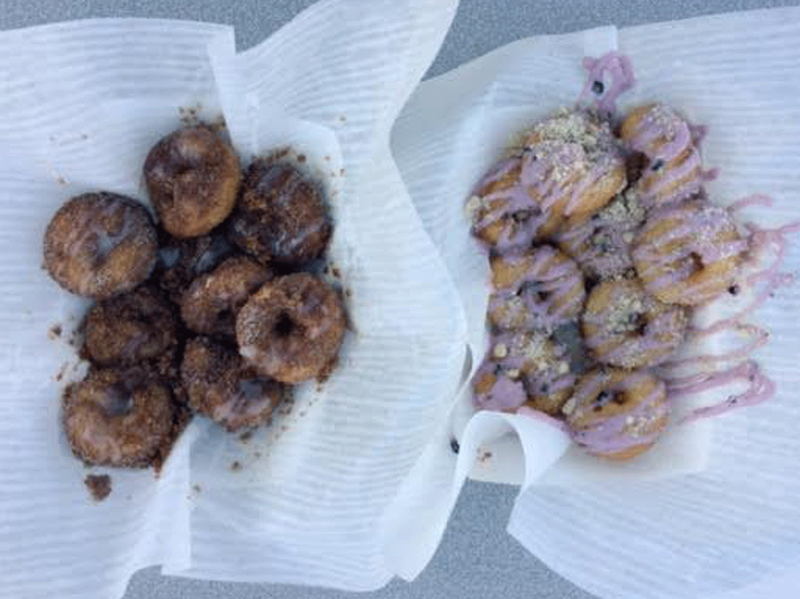 Another thing I liked was their blueberry glaze, which is similar to Donut & Deli’s, but not quite as good. And we loved chatting with Darla! I understand that sugar and flour are vegan, but it’s just hard to get it out of my mind when someone advertises that their donuts as vegan. In all reality, I was pretty impressed with the dough that these guys have created for their donuts. It was dense and delicious. What lost me a little bit was the toppings. I’m not a huge fan of irregular flavors on my donut. I tried the rose, the lemon lavender, and the triple berry. Rose was pretty good. The lemon lavender was wild. I think lemon alone would have been good. Lavender kept throwing me off. And the berry was decent. I didn’t actually finish any of the donuts, which I guess is telling. But I did enjoy trying the flavors. Prayers have been answered. No more are the days of laying in bed at midnight with the donut sweats wondering when you can get your fix. Utah has finally felt the impact of the MAGA campaign with Donut Stars 24/7 service. Donut Star has a wide variety of donuts to get and a one to stay away from. I was impressed with the donut holes and could eat those for breakfast, lunch, and dinner. A good maple bar is a staple for me and the chocolate twist (HUGE BTW) were exceptional. Usually you can tell the quality of a bakery based off the glazed donut but I couldn’t get past a couple bites. Overall 8/10 experience, would recommend late night runs often. This place isn’t exclusively a donut shop. It’s a German bakery with all kinds of German treats. But we were enticed to go here for their croliner (basically a cronut with filling inside). I’m a fan of the cronut, so I was all for a cronut with filling. They have a maple, a chocolate, and a raspberry. The chocolate is probably my favorite, which is filled with cream similar to a bavarian cream donut. It’s a lot harder than a traditional donut, so don’t go expecting something light and fluffy. But it’s definitely worth having! 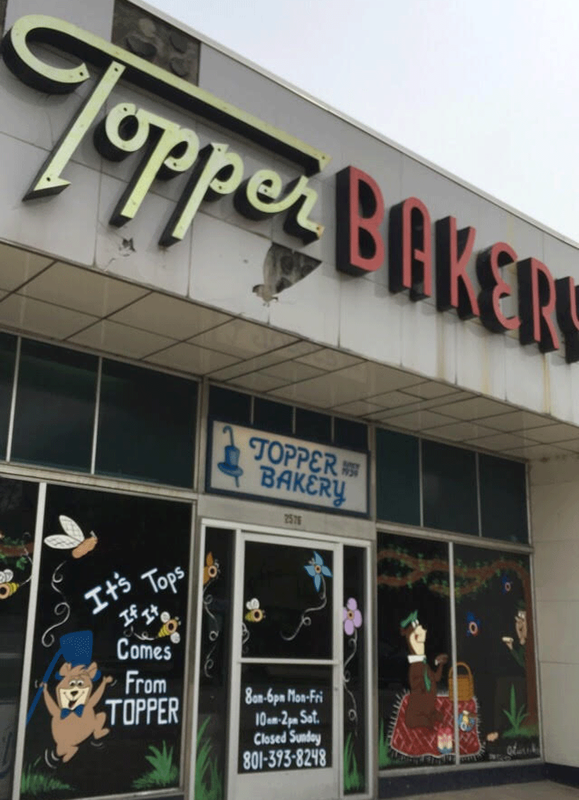 This Indiana grown donut shop is about to explode in Utah. With the first storefront opening in Daybreak and another opening soon in Kaysville. We heard about this early enough to catch the Grand Opening celebration and were not disappointed. 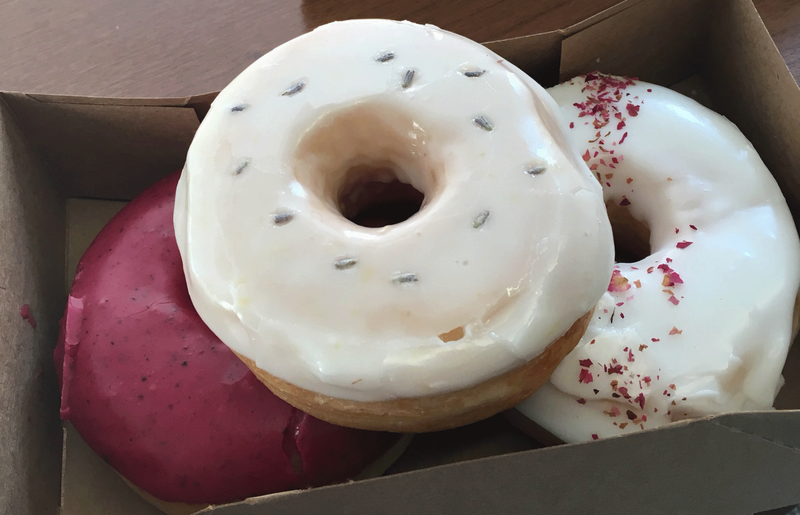 All donuts are topped with a world class glaze but the dough is infused with flavor. Ex: a chocolate donut is made with chocolate dough, an interesting take on the classic donut. As the official donut sponsor of the Indiana Pacers look for these guys to make a push in the Utah Jazz organization. Could you imagine eating a donut courtside at a Jazz game??? I’m looking forward to living in a world where this possibility exists. Picture Voodoo Donuts but midget size. Lots of options (fruity pebbles, homer simpson, birthday cake) you name it, they have it. Lots of character in this shop but definitely caters more to the “I wanna try something crazy” more than the classic donut fan. Talks of one opening in Sugarhouse in the future. Hands down best donut shop in Tooele County. I grew up on this donut shop when my dad would take me to get 50% donuts in the afternoon but had to give them a more recent visit for a true comparison. Riding the donut craze they have branched out to cereal toppings and other wild varieties but their originals are still the best. Give their blueberry donut a try, you’ll come back wanting more. First, I want to get this on the record: I’m a huge fan of gas stations. But generally the donuts within are made somewhere else, and they are only there because people need something to go with their coffee. After visiting and tasting of these unique, made-in-h̶o̶u̶s̶e̶ station donuts, I have come to the conclusion that this is not actually a gas station. It’s definitely a bakery. You know in The Office when the crew goes to LaVerne’s Pies Tires Fixed Also? This is Utah’s very own version: Kamas Donuts Gas Sold Also. Solid variety, and great dough. 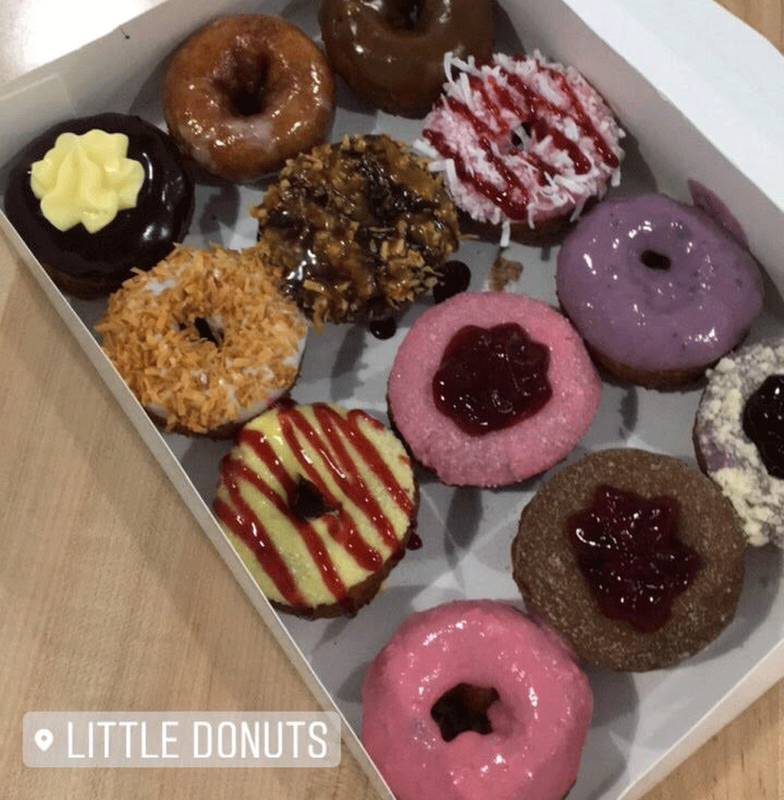 In terms of what to get, I liked everything I tried, but one unique donut I will mention was a traditional raised donut topped with a light-brown chocolate glaze. It reminded me of the flavor of chocolate milk. A solid rendition of the traditional chocolate glaze. 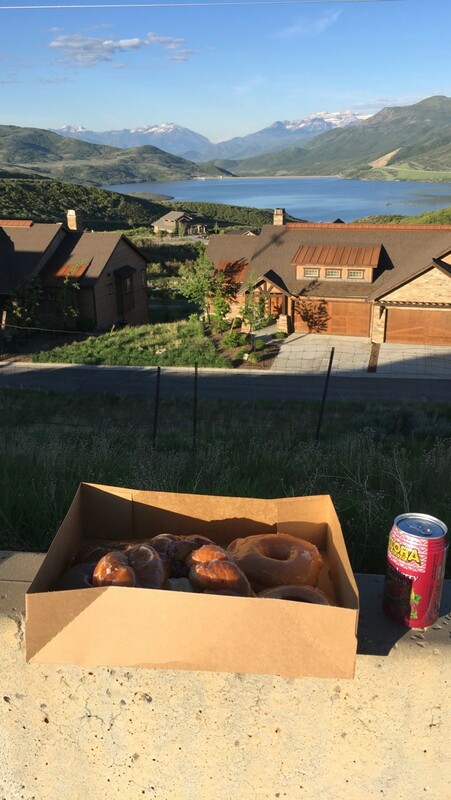 Plus, if you make the drive out there, you can eat your donuts with views like this. Unfortunately, this shop has closed twice since we started our research. We hope that the third time is the charm. It’s a sad day when the world loses a donut shop. When they were open, it was the most unique donut I’ve ever had. Thick and hearty, I usually have the stomach for 3–4 donuts before I am full, but at this shop I could only digest 1 donut before I felt full. We pulled up at our typical early hour and were surprised that the shop did not open for another hour and a half. The owner noticed that we were waiting and opened the doors to us early and gave us first dibs of the day. Great donuts, but even better management. You know when you hold a brand new baby — like so new it still looks a little like an alien — and every ounce of your being is focused on making sure you don’t break it or drop it or press too hard on the soft spot? That’s exactly how I felt when I pulled my donuts out of the bag at Avenue Bakery. I cannot begin to describe how perfect their dough is. In fact, this was the only shop on our list where we felt compelled to ask the guy behind the counter what the hell they put in their dough. 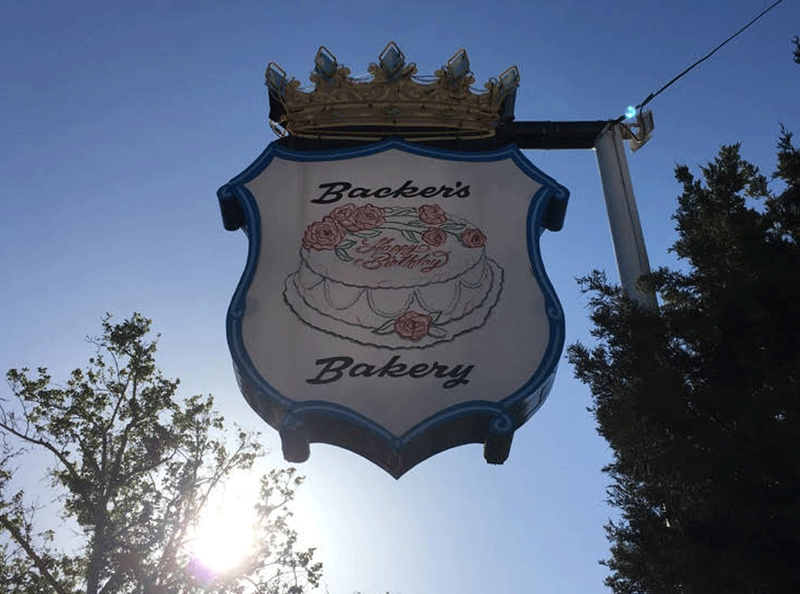 I truly had an out-of-body experience in this holy little bakery. Hands down best maple bar I’ve had in my entire life. A perfect 10 on all levels. Lehi Bakery uses a frosting rather than a glaze, and that made all the difference. Their glazed donut may have been laced with cocaine because I was left wanting more. You won’t find a large variety because what they do they do right. If you are looking for a classic donuts this the place to go. A true diamond in the rough. **Braden’s Update** When we initially reviewed this place, I was not aware of the existence of their fruit pocket. I am now, and I would say it was a discovery on par with Copernicus’s revelation that it is actually the earth that revolves around the sun. Get it. The Khawi Leonard of bakeries. One of the best but doesn’t get the superstar treatment it deserves. Their dough is soft, fluffy, and melts in your mouth. This is a shop that is worth going out of your way for. Something happened to me in Spanish Fork. I did my usual routine at a new donut shop where I ask what the most popular donuts are. The guy behind the counter indicated that their cake donuts are really popular. Fine. I picked just one (and an old fashioned if that counts) and the rest raised. Of all the donuts I had, the crumb cake donut was BY FAR the best. Not even close. It was like a moist coffee cake shaped into a donut that fell apart as I ate it (in the best way). With the exception of the Homer Simpson donut (pink frosting, sprinkles) I didn’t even finish any of the raised donuts I got. They were good, soft donuts, but a little too airy for my liking. However, I would (and will) 100% go back for that crumb donut. And when I do, there’s a good chance my order may be entirely cake donuts… Who am I? Great work, Cowboy Donuts. Perfecting a donut takes time and space to think/play with your creation. For being founded in a trailer they have done a da*g good job. You’ll find them in food truck roundups with a long line waiting for their delicious daily specials. If the blueberry creme, nutella, or cinnamon swirl is on the menu you will regret not getting a triple helping. Give them a follow on IG to find out where you can find them @artcitydonuts. We had to seek out most of the donuts shops on this list, but this is one of the only ones that came to us. It was parked on the street outside my office, and I couldn’t believe I had never heard of it. They serve mini donuts similar to Art City. I wasn’t super impressed with the toppings or the dough. However, the dough had less of a raised-dough consistency than I prefer. So if you like cake donuts, you may like these better than I did. But one thing I did love was their set up. Right outside the trailer is the mini donut machine. That’s pretty rad. It would be a cool option for a party, which they do. If you don’t know, malasadas are the donuts of the islands. Imagine sitting in a hammock on a white sandy beach. A light breeze blows through your hair. The sun is out, but its rays are blocked from hitting your face by a lush palm tree overhead. You put your book down to reach for the pina colada next to you. The cold dew on the outside of the container is only half as refreshing as the cool, fruity beverage pouring into your mouth. Now put all of that inside of a donut. As a filled donut aficionado, I highly recommend Clark’s Malasadas, especially the coconut one. Be sure to follow them @clarksmalasadas so you don’t miss when they come to your neighborhood. That’s all she wrote! Hopefully you found something that will change your life. We definitely did. Relentlessly searching for truth in all things.